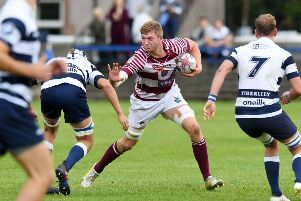 Edinburgh scrum-half Nathan Fowles believes tight bonds off the field and players taking more responsibility for what happens on it will help drive the club to a more positive season this term. The Capital side slumped to a highly-disappointing ninth-place finish in the Guinness PRO12 after topping the table earlier in the season and the pressure is on Alan Solomons and his squad to up their game. They get their campaign underway with a trip to Cardiff tomorrow week and get their first hit out on the field this evening when they face Sale Sharks in a pre-season friendly at Heywood Park (7pm). Fowles came through the Sale academy and, while he is looking forward to a bit of a homecoming, his heart belongs to Edinburgh now after he joined in 2015, initially on loan. He is Scottish-qualified through a grandparent and is hoping for more game time this season after finding himself third choice for the No.9 jersey behind Sam Hidalgo-Clyne and Sean Kennedy.